We are offering this program in a one and a half day trip, starting off from Wadi Rum in the afternoon, sleeping in the desert, climbing the mountain Jebel Um Adaami (the highest mountain in Jordan) early in the morning and continuing in the afternoon to Aqaba, where you should arrive by mid afternoon. Jebel Um Adaami isn't a difficult climb, it is an uphill walk on a rocky path. Most people take between 3 to 4 hours to climb and come down again. The views from the top are magnificent. After climbing the mountain, we drive through the desert, through mainly unfrequented valleys to reach the Desert Highway between Amman and Aqaba. Here a taxi will meet you to take you to any central point of Aqaba that you might indicate. This is a great trip, going through the distant valleys of the Wadi Rum area and then following the winding valleys between Wadi Saabit and the black granite area at the edge of the red sandstone. 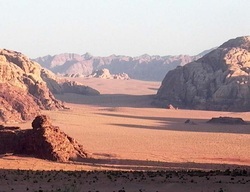 We take the afternoon for this drive and show you some of the side valleys of which there are a great many - this part of Wadi Rum is even more of a labyrinth than the parts closer to the village. But of course it depends a great deal on just how much time we take to come down from the mountain. This trip can be easily added on to a one day programme such as "A day with the Bedouin". In that case the price will be lowered by 10 JD/person since the overnight sleeping is included in the first trip. Important note: This program is not possible during the winter months of November-February. It needs a longer day than we have at this time. We cannot offer this trip the other way round - that is Aqaba to Um Adaami. This is not allowed under the rules of the Nature Reserve. This price includes all meals, overnight stay in the camp and sleeping equipment, the guide for climbing the mountain and the taxi to central Aqaba. If you are looking for more than two days in Wadi Rum there are a number of possibilities that can be added on to any of the other trips. Look as well for our three and more day programs. If you are traveling alone please send us a message and we will try our best to find a tour you can join to reduce the costs and make it as comfortable for you as possible. You can find our general information about our tours here.